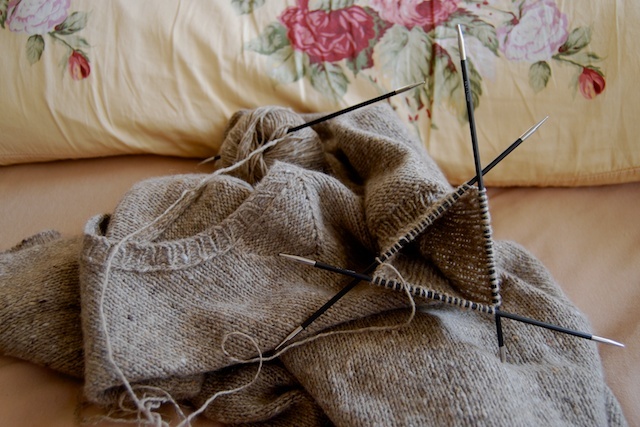 Two inches of ribbed cuff is all that separates this pile of knitting from being a sweater. My first ever knitted sweater. It's already fully seamed, blocked, and the seams are even steamed nicely with my iron. I did all this before adding the cuffs so that Kai could actually try it on, and I could be sure to knit the cuffs long enough to be to his liking. One cuff complete, one to go. Please excuse me while I get back to it. Lovely!! I think about making a sweater - but so far that is all I've done...think about it. Fantastic job!! Its gorgeous - well done.